Canada is huge and spectacularly diverse. Arguably, the best way to truly experience the country is by train. Travelling by rail not only gets you from A to B but it is also by far the best way to take in the spectacular and ever-changing scenery in relaxed and comfortable surroundings. VIA Rail is the public passenger rail network in Canada which runs year-round and operates trains throughout the country. It enables travellers to journey from coast to coast, visit the major cities in Eastern Canada, view the polar bears on the shores of Hudson Bay or travel through the Rockies and other mountain ranges in Western Canada. 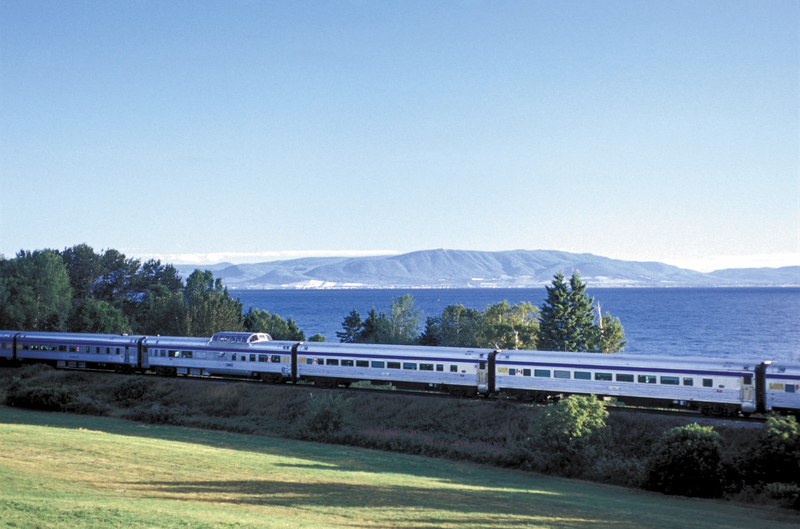 Save 20% on VIA Rail Canada rail bookings for summer 2019! This offer is available as part of the VIA Rail Seat Sale on The Canadian (from Toronto to Vancouver), The Ocean (from Montreal to Halifax), the Churchill train (Winnipeg to Churchill) and The Skeena (Jasper to Prince Rupert – touring class only). Call us on 0191 246 0708 or email us sales@railtourguide.com to enquire about these fantastic savings. A journey of almost 4,500 kilometres between Toronto to Vancouver, The Canadian takes four nights to complete its epic journey. The vistas change daily, from the lakes and forests in the east to the Rocky Mountains in the west and the prairies in between. Winter is a magical time to experience this journey, with the landscapes transformed into snowy winter wonderlands, whilst passengers sit back and take it all in from the warmth and comfort of the train. Many winter festivals take place along the route at this time of year too, including “Christmas in November” at Jasper Park Lodge and the Festival du Voyageur in Winnipeg in February. 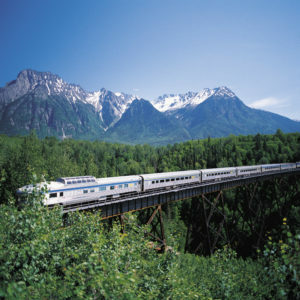 This rail journey is an exciting way to see the real Canada, in a relaxed and comfortable setting, combined with exceptional service throughout. Passengers travelling in Sleeper Plus or Prestige Class enjoy the exclusive use of a number of carriages such as Skyline and Park cars with their ‘glass’ observation domes, giving a 360 panoramic view of the surrounding countryside. An overnight journey of almost 24 hours, The Ocean travels eastwards from Montreal following the St Lawrence river. The train then crosses into New Brunswick before arriving in Halifax, Nova Scotia. Overnight accommodation options vary from economy class to a private cabin in Sleeper Plus Class. Travelling in Sleeper Plus Class includes a private cabin with a washbasin and WC, plus exclusive access to a Park car with its lounge and observation dome and all meals served in the restaurant car. This is an ideal journey to make to experience both the English and French speaking cultures of Canada. Many passengers choose to combine a trip on ‘The Ocean’ with a self-drive tour through the Maritime Provinces or perhaps a city break in Montreal and Quebec. The two-day journey from Jasper to Prince Rupert is not to be missed. 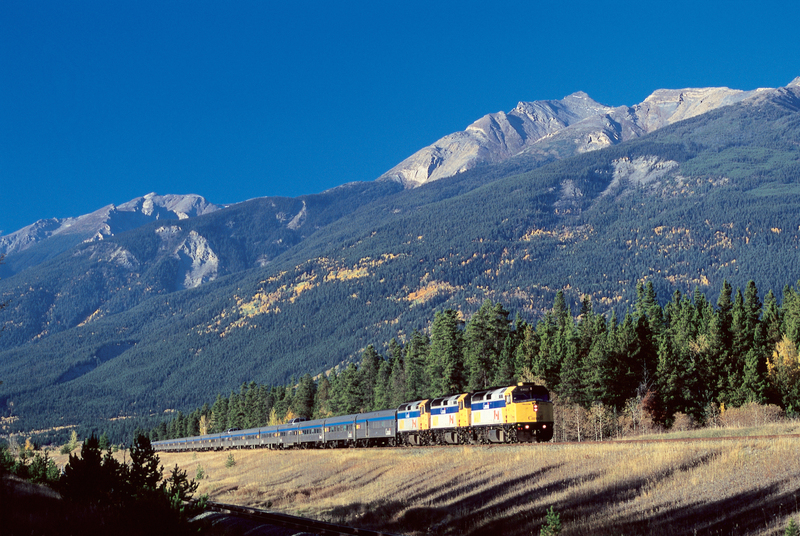 The train meanders through the incredible landscape of Jasper National Park, the Rocky Mountains and Northern British Columbia before arriving in Prince Rupert on the Pacific coast. Travellers onboard will take in vast lakes, salmon-filled rivers, abandoned settlements, sawmills, lush farmland and rural communities. Wildlife such as bear, moose, elk, deer, wolves, coyotes, eagles and hawks may be seen during the trip. It’s not uncommon for the guard to make an announcement such as ‘bear on the left’ or ‘moose on the right’. On this train travellers spend the days on board, but overnight in a hotel in the town of Prince George. The rail journey can be taken at any time of the year but is most popular between May and September. During the peak season, travellers can choose the option of Touring Class which includes all meals while on-board, and a seat in the Panorama car which boasts 360 degree views over the surrounding country.